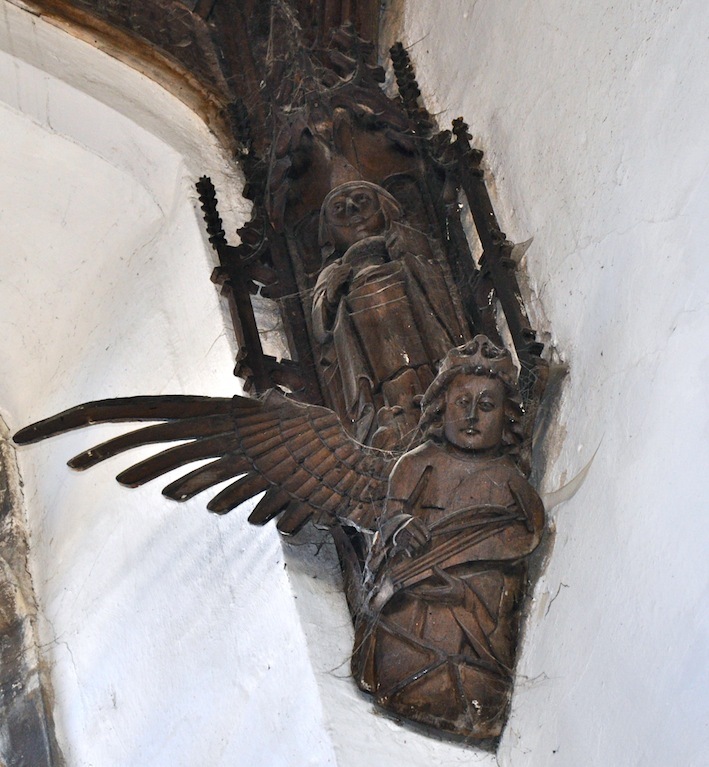 St Wendreda in March, Cambridgeshire is really just a roof full of angels and thats all there is to it, angels, angels everywhere. I have explored the exterior of the church on a pervious posting so now it’s the time of the angels. I have tried hard with the photos to get over the awe inspiring feeling you get when you first see them, unfortunately I am not a photographer in the true sense, I am a snapper as I have said before, hopefully I am improving, but I like to document things more then being artistic, although I suppose you can do both if you are gifted. But I am happy with my attempts and hope the old saying….practice makes prefect…is true. Anyway back to the church, on the exterior posting of St Wendreda there are details of the church, this posting is more about the angels as they really deserve a post of their own. The roof is a double hammer beam, made of wood that has weathered unevenly so that the rich brown is patched with uneven rosy highlights. This magnificent roof should be in a magnificent building, but the church is just rather pleasant than magnificent, but maybe this is the reason that the angels survived. The building of the roof seems to be dated from 1523 and 1526, with money given by William Dredeman. 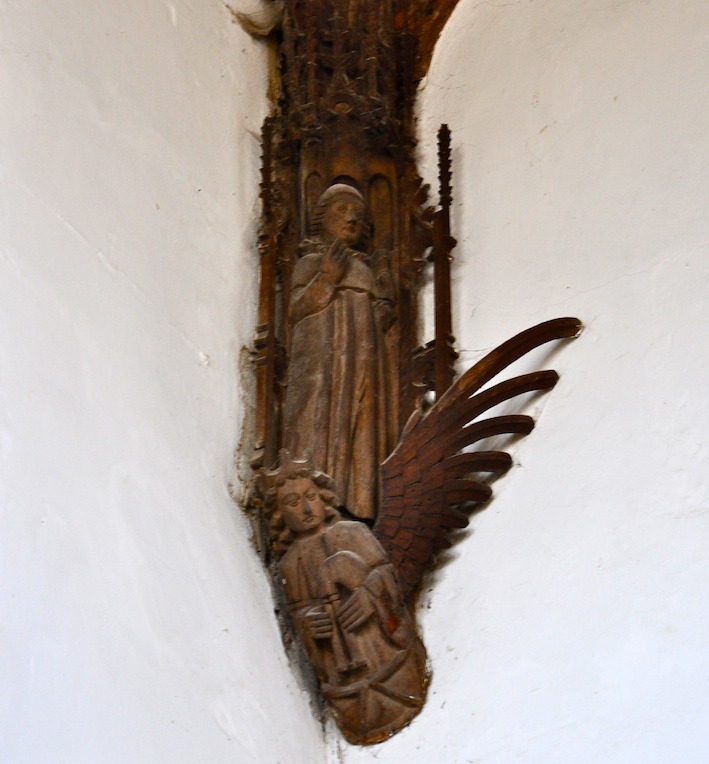 During the English Reformation idolatrous items like the angels, were being destroyed throughout the country, and when Henry VIII’s commissioners arrived the angels seem doomed. 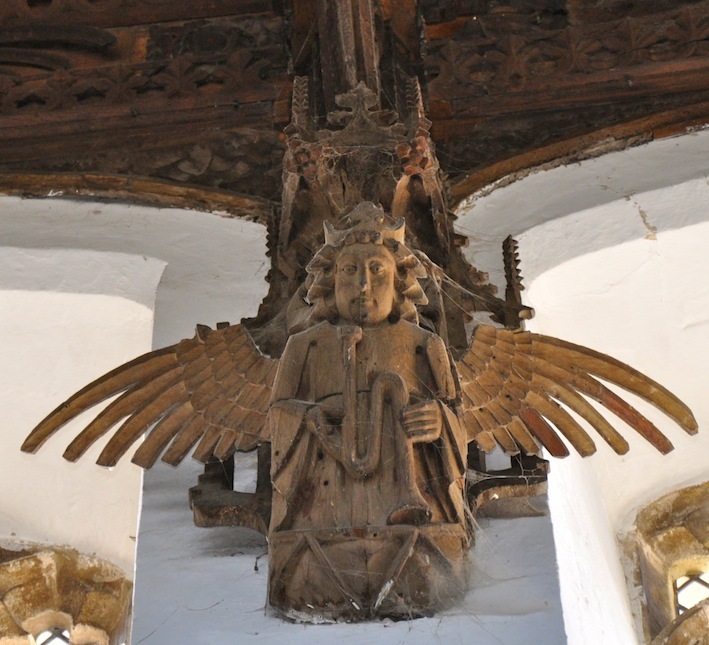 But some quick thinking on the part of the merchants helped by welcoming them with food, drink and loading them with church silverware, so the 120 angels stayed flying in the roof, well thats how the story goes. But they did survive Cromwell’s troops, death watch beetle, and are still in remarkably good condition. 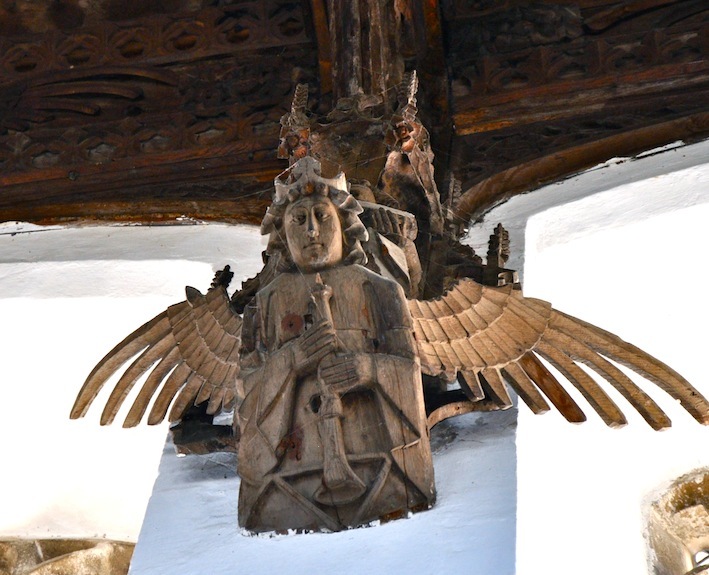 Although it is called the ‘angel roof’ there are other figures represented which include martyrs, apostles and saints. The carvings are fixed to the king-post, are of the highest order, and really quite astonishing. 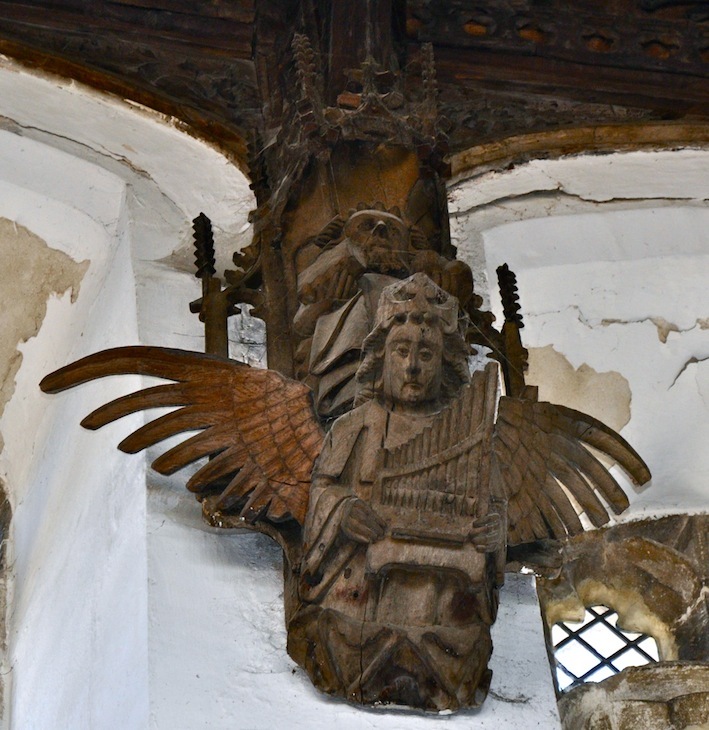 The corbel angels are the best they carry musical instruments, and on their backs they carry statues of the saints. 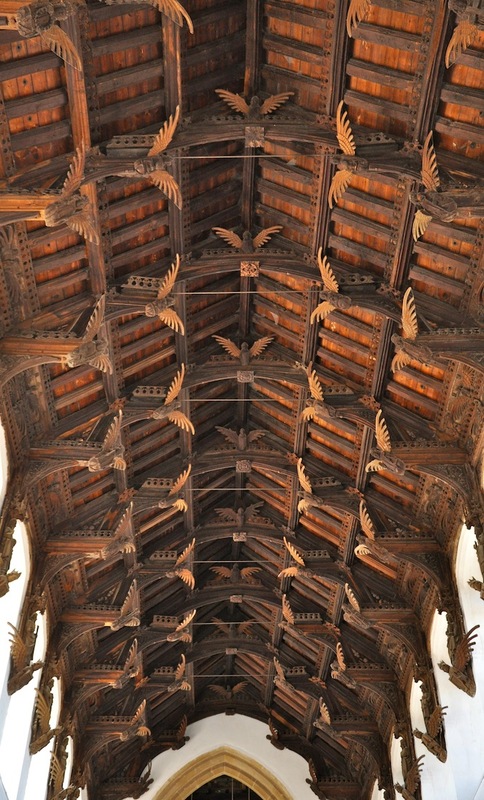 The roof is so rich that is shades everything else, but then what does it matter, the church has one of the best timber ceilings in the county, in my view, in the country so far. I love your shots!! The angels are really impressive and very well preserved. I’m glad King Henry VIII wasn’t able to destroy them!!!! Stunning ! Wonderfully photographed. Thank you for sharing yet again. So enjoy your posts. You are far more than a happy ‘snapper’ Lynne, these shots are beautiful and I love the idea that the rampaging commissioners were distracted with food and silver. Thank you Rachael…..but I did find they were good models 🙂 so it wasn’t too hard to take good snaps 🙂 Thank goodness they could be bribed and just wonder about the other churches that still have their angels, it could have been that they had the same commissioners……. p.s. sorry I took so long to respond. I didn’t see that you’d replied. Hi Adrian, I will email you tomorrow, I can do the photo at a much higher resolution, but I want to make sure I do it right. I like the sound of the angels on a record label, should look great. Hi Adrian, I am having trouble at the moment with the internet. All my photos on the blog that have more than one photo per page are not showing on my pc. I came to work, we have our own company, so I though I could be it with my works pc, but its something to do with the server. So later when I get home I will do a new post, with the new photo, fingers crossed. Hi Adrain, I have put on a new post for the photo at the higher resolution, hope its ok. Please let me know when you have finished so I can remove it. Dear Lynne, thank you so much. Obviously it will be altered to make the cover. I can credit you in the booklet if you like for the image use, (assuming my designer can make it work), but I’ll need your full name. You can always email me or call me. My email address is adrian@conviviumrecords.co.uk / 07724631797. Hi Adrian, yes I will mention everything in the email and it sounds really interesting. I’m just glad that my photo inspired an idea, if thats what it did and it will be interesting to see what the designer does with it. Just love the angel roofs!!! Lovely pics and glad that the iconoclasts did not get to touch or deface them. Fabulous pictures! Ref iconoclasts, indeed wonderful that they were not destroyed. Fabulous pics of the angels. Am so glad they are still there. Documenting is a word I use in reference to my snaps also but I think you put enough thought and creativity into your work that your images can be called photographs and you a photographer. But what ever you call your images and writing I enjoy them. Thanks again for sharing. Thanks for the kind words and keep having fun with your camera. “in the flesh” today – as it was locked, and no key available as it went missing a week or so ago. I’m sure that we’re not the only people to travel a long way to see this historical and artistic marvel. Bill Huband (Revd.) – Herefordshire. So sorry that you didn’t get to see the angels. I was very lucky on the day I choose to visit, the church was only open because they were doing a sound check for the next Sunday service. It’s normally locked. The door was open and I was in like a flash, luckily the young men said it was ok and I took my photos. I’m afraid most of Cambridgeshire’s churches are locked, which is sad. Such a shame you had a wasted journey. 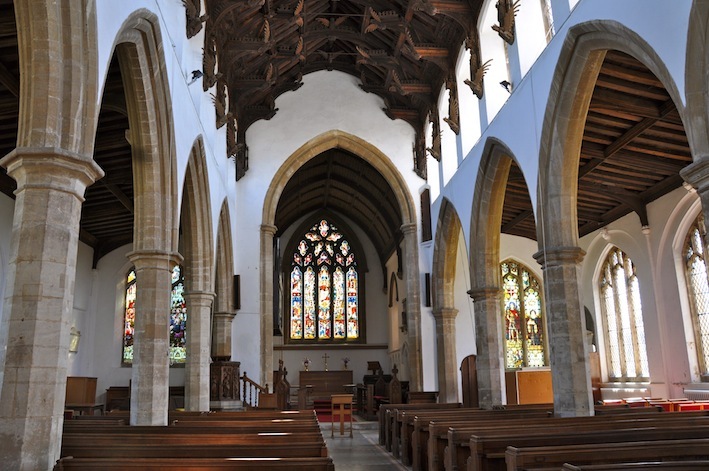 But you do have some lovely churches in your part of the country and they are normally open, have visited lots. Anyway, so glad that you enjoyed the photos, and that at least you got to see them. Hi. I visited yesterday and although the church was locked (the key which used to be at the garage was stolen) we called a churchwarden – there was a list of phone numbers on the outside of the church hall – and she came out and unlocked the church for us. It was really kind as she had to drive to the church, but they obviously still want people to be able to see it. I am studying in Manchester at the moment, writing my dissertation about the changing role of angels during the Protestant Reformation. I love this post and all the amazing pictures you have taken, not only of this angel roof but also all the stained glass images and other angel roofs. It would be great if I could have a chat with you about these posts and possible speak with you about including a couple of your images? No problem, that’s perfect, thank you! I messaged you a few months ago about using some of your pictures in my dissertation at Uni. 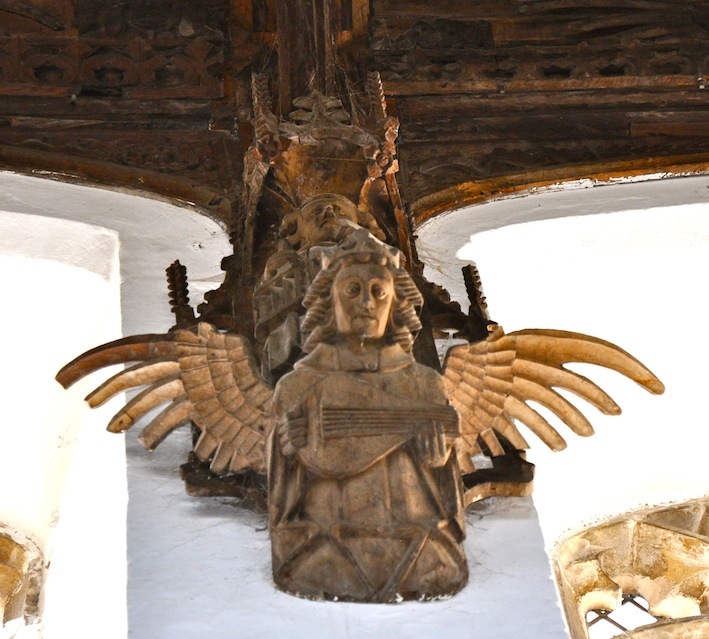 Could I please ask for permission to use an image of the roof angels at Pinchbeck church in Lincolnshire? I would just need your full name to cite in my work. Yes you may use the angels and good luck 🙂 My full name is Lynne Jayne Jenkins.